Sometimes we embed media and objects in PowerPoint files. These files and objects could be images, videos, sounds, documents, etc. One of my colleagues had an old PowerPoint 2010 file, with a video file embedded in it. In order to reduce the final file size (when there is media embedded in a PowerPoint file, the file size increases dramatically, based on the media’s size. This include embedded images as well), he asked me to take the video clip out of the PowerPoint file and upload it to YouTube. Honestly I had no clue how to do that. I was trying to right click on the video preview, but there were no “save as” or “export” options. Interesting. So I researched the web, and found a beautiful trick to solve it. By default, Windows Explorer is set to hide file extensions. In order to extract media, we first need to make sure Windows Explorer is set to show file extensions. Open Control Panel: Start -> Type “Control Panel” -> Enter -> Choose “Control Panel” under “Programs”. In the Control Panel, Click on “View By” and choose “Category”. Click on “Appearance and Personalization” and then click on “folder options”. Click on the “View” tab and then make sure to clear the “Hide extensions for known file types” check box. Now that Windows Explorer is set to show file extensions, let’s go to the folder where the PowerPoint file is. 1. Right click on the file and choose “rename”. 2. Change the file extension from ppt / pptx to zip. 3. 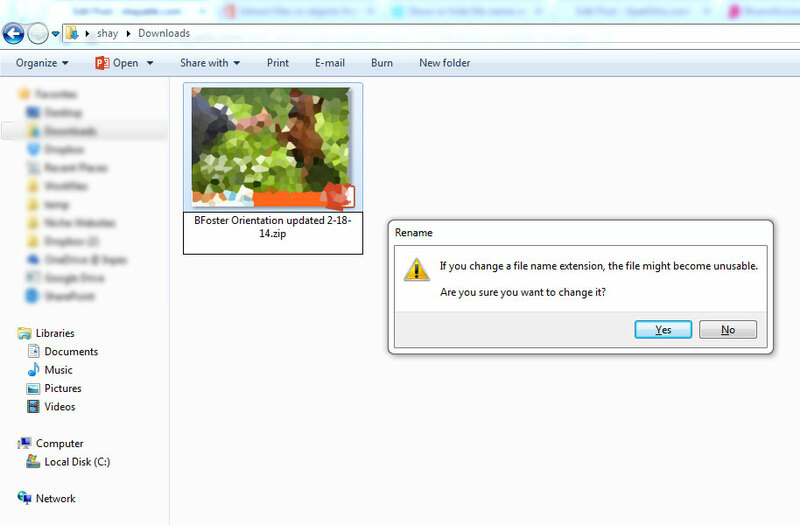 Windows will ask us “If you change a file name extension the file might become unusable. Are you sure you want to change it?“. 5. Double click the new renamed file, in order to view its content. 6. Double click on the “ppt” folder and then go to the “media” folder, and here are all the images, videos and files of this PowerPoint file. Don’t forget to rename the file extension back to ppt / pptx in the end, in order to open or edit the PowerPoint file.